Unzip around the outside of this bag for an extra inch of storage space. Store your mp3 player in the front zippered pocket, and place your earbuds through the opening. 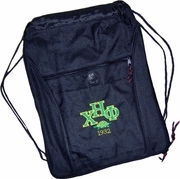 Listen to your music securely with this sturdy drawstring bag. It measures 18" x 12" x 1" (when opened).